Do you need someone to help you build your dream? Someone who can handle your scheduling, email, and other tasks while you focus on the big stuff? Someone with the same native language and same culture? The only thing worse than not having an assistant is having the wrong assistant. Today, I am talking to Tim Francis, founder of the Great Assistant Program. During downtime as a touring drummer and after overcoming an illness, Tim had an interest in property management. He realized a brute-force method was not a sustainable long-term strategy. He needed help. He tried assistants from all over the world, only to have disastrous results. So, he created the Great Assistant Program. [08:02] Tim had the common problems of letting go of control, not trusting others, not wanting to take time to train or manage, not knowing where to find assistants, and not knowing what to delegate. [08:35] After about four years, Tim was willing to offer higher pay to find an assistant in the United States or Canada and make a long-term commitment to them. [09:02] Tim learned that paying the lowest dollar amount and making the smallest commitment to someone, always resulted in them being here today and gone tomorrow. [09:47] Tim started using various tools, such as the Kolbe Index, that focus on different personalities and management styles. [09:56] Tim has had negative experiences using Upwork, a Website for freelancers to connect with business owners and entrepreneurs about jobs. [11:15] Tim discovered which marketing and operations tasks he could delegate to his assistant. [11:29] By having the right assistant, you can go from working 80 hours a week to getting so much done quickly in half the time. [11:48] Tim started helping others get an assistant, and over time he realized that there was a business need to help clients and friends find great assistants. [12:05] Tim created a management team and hired a corporate trainer to train assistants to make sure they are ready. [12:30] The Great Assistant Program has an 85 percent stick rate. For the remaining 15 percent of assistants that don’t fit, there is a 90-day rematch guarantee. [14:10] What’s the dollar-per-hour cost in real terms? You can pay someone in the Philippines $4 or someone in the United States or Canada for $16-20. The Philippines is less expensive, but it takes hours to explain things repeatedly and fix mistakes later. How much have your really spent? [16:21] If you have an assistant from North America that is high-caliber, they will produce at least 2-3X the work and results. You can feel safe that they understand you and trust that they will treat your customers well. [18:28] Finding a great assistant can be an issue for entrepreneurs starting out to multi-millionaires. It doesn’t matter how big or small you are. [19:14] Time is your scarcest and most valuable resource. Give people money to get more time. [19:48] The Great Assistant Program takes care of what you need to find the right assistant. It takes everything off your plate – from posting jobs, figuring out what you need, to finding matches. [21:15] You are probably willing to pay thousands of dollars to undo what previous assistants had done. You don’t want to play Russian Roulette anymore. [22:40] Go to DoorGrow.com/greatassistant and fill out the form that determines if you need a great assistant. Plus you get a video gift! [24:01] What is your #1 frustration or challenge in getting a great assistant? The #1 response was control and trust. [24:33] Anytime in business, including property management, if you feel like you are taking a blind risk, that is a horrible feeling. Use the process provided by the Great Assistant Program to reduce the risk. It involves expanding your pool of talent, using the Kolbe Index, and trying work and cognitive tests. [26:23] How do you determine what you will have an assistant do? In property management, there is a lot of work to do. Have your assistant work on preparatory documents, lease renewals, pulling records, scheduling interviews, research, setting up events, posting rental ads, contract signing, scheduling move-in appointments, and tenant screening. [29:15] Just like with surgery, the surgeon does not prepare the patient and tools. The surgeon only does what is appropriate. This is not a form of superiority, it is about appropriateness, and everything done regarding the surgery is vital. [31:09] Critical decisions when it comes to anything that is strategy and high-level skill or high-level access is yours to handle and keep as the property manager. [33:28] Unpacking is the secret to delegating work. Categorize your email inbox for your assistant to tackle specific areas, then you do not need to worry about them accessing sensitive information. [34:53] As a business owner, you need to shift your focus away from tactical work and shift it toward strategic work that moves your business forward. [35:05] Develop standard operating procedures (SOPs) to teach your assistant how to do specific tasks and perform processes. If you can do it once, someone else can do it forever. [40:12] For example, if your assistant handles tasks related to an event, it gives you time to connect with people rather than running around performing tactical tasks. [41:41] Some fear having a virtual assistant rather than an in-office assistant. However, having a virtual assistant can be a competitive advantage. You are not bombarded with constant interruptions through questions and offerings to help, plus you cut your staffing costs. [44:05] For example, you are in a fender-bender and what to fix your car. You face a myriad of factors and a decision to make. If you want to fix your car good and fast, it’s not going to be cheap. If you want it to be fast and cheap, it’s not going to be very good. If you want it to be cheap and good, your going to have to call your uncle to work on it. So, it is not going to be done fast. Good, fast, cheap – usually, you can only pick two of the three. You can’t have it all! [45:08] In property management, the three pieces involved with hiring an assistant are talent, compensation, and working conditions. For a 9-to-5 traditional position that meets all three, you have to pay a ton. If you are more flexible on the work conditions, you can get someone at your preferred pay rate who is exceptionally talented. [46:45] What is more important than salary to these qualified applicants is being able to see their family more often and be a part of precious, once-in-a-lifetime moments. [47:41] What percentage of Americans want to work from home? About 67-68 Americans wish they could work full-time from home. [48:39] Various technology and tools, including videos and online project management software, allow more people to work from home. [51:08] You don’t need to feel like you are exploiting someone by paying them $16-20 per hour. The reality is that if you let someone work from home, they truly appreciate and value the time it gives them with their family, the ability to work in the comfort of their own home, and the money they save on not having to commute or on child care. Working conditions are part of the compensation. [53:40] When your relationship with an assistant does not work out, figure out why. Did you get an assistant too early? Don’t know what the high- and low-level tasks are yet? [57:00] If you are an entrepreneur who sees your team as some sort of servitude or slave to you, then you are not a good fit for the Great Assistant Program. You can’t treat someone terribly because you are the problem. Instead, how can you support your team? [59:00] As an entrepreneur, see the possibilities that come with getting the right person to support you and embracing the role of being a coach. [01:01:00] What is the order of what you are delegating? As an entrepreneur, rather than going off and doing something else once you hire an assistant, instead show them how to take over stuff that you are already doing. Also, pick the right tasks in the right order. [01:02:39] Record yourself performing a non-critical task that is easy to learn and teach, let your assistant watch it, then watch them perform the task. The training cycle is complete, and you are getting a pay off just a few days later. [01:03:48] Trough of Sorrow: The thought that once you hire an assistant, everything is going to be sunshine and rainbows. The reality is the opposite because you need to train, onboard, and manage them. The negative investment becomes less and turns into a positive ROI. [01:04:45] Investor Mindset: The assistant keeps getting better as you invest in them over time. [01:06:25] View every team member as an investment. The longer you have them, the better they get. Look for a relationship that will make a massive difference to your company. [01:07:45] Energy Management vs. Time Management: The biggest wins to when you onboard an assistant is to figure out what’s taking you time and what’s taking you time that you hate doing? The things you hate, are the things your assistant loves to do. There is compound interest in the people you hire. Your very first hire should be an assistant. It’s a problem and a challenge knowing how to get an assistant. Jason: Welcome, DoorGrowHackers, to the DoorGrowShow. 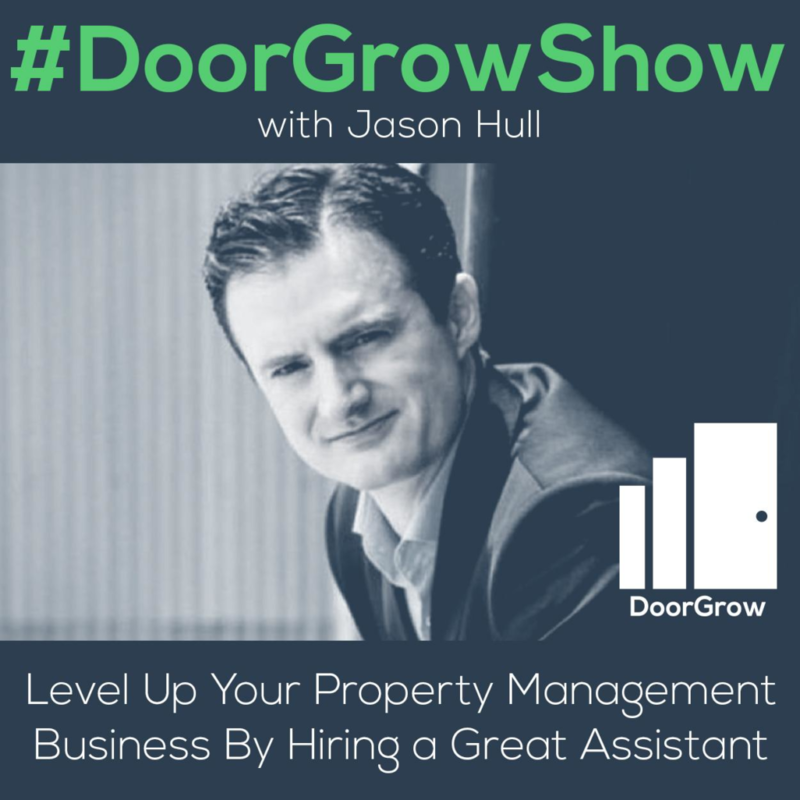 If you are a property management entrepreneur that wants to add doors and expand your rent roll, and you are interested in growing your business and life, and you are open to doing things a bit differently, then you are a DoorGrowHacker. And I am today, sitting down with Tim Francis. Tim, go ahead and introduce yourself. Tim: Good day! My name is Tim Francis. If you need any money collected, just ask me. I got this raspy voice, it could do wonders for collections. Jason: Tim, you got a little bit of a cold going on? Tim: Yeah. That’s all, that’s all. Yeah. It’s beautiful here in Austin, Texas. It’s where I live now. I’m a Canadian. I spent my whole life up until just a few months ago living in Edmonton, Canada. Real Estate Investing was a part of my path at one point. I was actually a touring drummer and we play shows by night, and there’s nothing to do in all the small towns that we would play in on the off days. What I would do is I would sit and I would study Creative Financing and Landlord Strategies. I ended up acquiring four houses. I had a lease option, I had a wrap finance deal, I did a joint venture deal. All the funky no money down stuff, I actually did accomplish. That was great until ‘08 hit and I lost everything. Not quite a bankruptcy but I hassled to negotiate my pants off as fast as I seriously could. Did lose about $100,000. The band met three sponsors, airplane eight cities and we actually made it all the way to the Western Canadian Music Awards but we broke up 20 minutes before the Western Canadian Music Awards Show. That happened, and I was scrambling to just find a way to make some cash. I started promoting a business speaker who’s speaking in Western Canada. He said, “Tim, if you want to kick this thing up a notch, pay me $20,000 to take my elite training.” I raised another $20,000. Of course ended up being one of the most useless courses I’ve ever taken. I was down another $20,000. The guy ended up being the leader of a pseudo Ponzi scheme. His business partner was literally convicted in court in Canada. It was in the news everything. The trustees identified something like 96% was unrecoverable. We’re talking millions were gone. The exhaustion of working the traditional 80-100 hour hustle as an entrepreneur, trying to figure out something to make a few dollars, combined with the stress of just all those losses back to back to back, and developed an illness. It’s December the 26th, 2010. I’ll always remember that day. The swelling had moved through my body very, very quickly. Alarming in fact how quick it happened. Within a week I couldn’t stand. Within a couple of days of that, I couldn’t walk. Unbeknownst to me, I developed a very rare illness called Erythema Nodosum. There is no treatment for it at that time, all I could do was just bed rest. Because the swelling had gone even into my elbows, I couldn’t even type, it was literally laying in the bed, staring in the ceiling day after day after day. There is no timeline, I just had to write it out. It ended up, Jason, being three months of not being able to walk, not being able to type, not use a computer, nothing. I guess, 2011, January through March is when it really it. I guess I would have been 26 years old. To go from having four houses and the excitement of the 2005, 2006, 2007 real estate, I lost almost all my property. I was able to keep my primary residence. I always remember, it really hit me one day when I had to choose between sitting on a flipped over laundry hamper in the shower to bathe myself or I could have my mom give me a sponge bath in bed. I just thought, wow, here we are. Thankfully, I’ve taken some personal development courses in the couple years leading up to the illness. The top of the personal responsibility became very vibrant for me. When I got sick, laying in bed day after day, instead of asking “Why is this happening to me?” I asked the question, “What have I done to create this situation?” I realized I’d been naïve, I had been inexperienced, I was trying to cheat the process of becoming a true entrepreneur, I had tried to get rich and famous above and beyond everything else, I was also messiah making trying to find this one guru who would save me kind of thing. I also realized that my John Wayne attitude of if it’s to be, it’s up to me. I’m going to do this all on my own. Nobody can do it as good as me. If I need to work, I’ll just #respectthegrind, and work harder longer hours. I was a varsity athlete also growing up, so hard work was something drilled into my mind. This John Wayne attitude had got me up to a certain level of success, but I knew that the brute-force method would not be a sustainable long term strategy. That’s when I really started digging in. I read for a second time the book The E-Myth. I came across Work the System by Sam Carpenter and a few others. I had attempted, prior to my illness, The 4-Hour Work Week. I had gotten assistant from India, I had tried Pakistan, and all bunch of different cities around the world. I just found that it was a disaster. I needed somebody that could be a mini me. That’s the very first person that I needed. Not somebody who’s a marketing expert or anything else. I needed a mini me who could be the second half of my brain. I need someone who’s going to handle my scheduling for me, he’s going to handle my email inbox for me, all these different things so I can focus on the big stuff. Furthermore, if that person’s going to be a mini me, they had better be in the similar same timezone, same native language, my case English, and somebody with the similar or same culture. Things that I was taking for granted, I didn’t have to spell out and have this awkward, weird cross culture issues. I’ve got stories upon stories of cultural hiccups, if you will. Tim: You too, okay, yeah. I checked on you ahead of time so I know you’ve done the Philippines as well. You’ve probably had your, “Where’d my assistant go?” Because some typhoon knocked out the one internet station on the island of something of the Philippines. Tim: Out of that, I continued to experiment with different assistants and methods and whatnot. Four years, I did it all wrong. Four years of getting it wrong. Having all the attitudes that are typical, like I don’t know how to let go of control, I don’t know how to trust, I don’t want to have to take the time to train, I don’t want to have to take the time to manage, I don’t know where to find an assistant, I don’t know what to delegate. All the super typical questions that I had, I didn’t realize at the time, almost everybody has those questions. You know what, there’s a way to get past them, I’m not the first guy to walk this planet and have this issues. It was about 4 ½ years ago that I finally just said, you know what, no more fooling around for $4 an hour in the Philippines. I’m going to spend $15-$20 an hour, I’m going to get someone from United States or Canada, I’m going to make a long term commitment to someone. Just as there is compound interest in investing in homes, in real estate, in the money world, so too is there compound interest in the teammates that we get. I was perpetually trying to pay the lowest dollar to somebody and make the smallest commitment and they were always gone, gone. They’d be here today, gone tomorrow. Here today, gone tomorrow. I said what would have to be true if I were to make a three year commitment, a three year commitment. Holy smokes, if I have to live with somebody for three years as my team mate, as my mini me, I’m going to get excited about training them. I’m going to get excited about managing them. If they make a mistake, perfect! Let’s jump in and let’s fix it. Now they know forever how to do something right. I’m going to be way more careful on who I’d pick in the first place. It’s the difference between marrying the first person you’re going on a date with versus giving it some time to really make sure you’ve got a good match. I started learning about the Kolbe Index, and different work tests, and personality tests, and management techniques with an assistant, and whatnot. And then developing a whole process. Anybody who’s ever put something up on Upwork which I know you have, brace yourself. Goodness gracious, if you put up just a really blank posting, you can hit refresh every three minutes and have another application in your inbox. It’s just a blender of humanity. Anybody and everybody supplying. Now you’ve got your full time career and job as an entrepreneur and now you got a second full time job just sourcing and going through these applications, hoping and praying that you’re going to get it right. It’s such a dangerous way to go. The only thing worse than not having an assistant is getting the wrong assistant. At that point, I know you’ve had people steal from you before, you and I both had people that are here but super unreliable, you get so frustrated, you don’t know where they went. They could be a really great person, really talented, they could be an American or a Canadian for that matter. But if you got the wrong Kolbe score, it’s just not going to work in the long run. We know that now because we’ve now placed 98 or 99 assistants who we’ve got such a huge [inaudible [00:11:06] to work from. I started helping a few people, just entrepreneur friends, get an assistant. Just overtime, I was just doing it more and more and more for clients, for friends, for whatnot, and said there’s a business here. We did a beta test of just 10 clients and that went so well that I went ahead and built a whole management team. I’ve got three team members right now that take care of doing the matches, of doing marketing and sales. We actually have a corporate trainer that we have hired and her role is simply to train assistants and make sure that they’re ready to be good for their entrepreneur. We can’t train everybody on everything but we can at least start the process and get the foundation in place. Here we are today. We help entrepreneurs in United States and Canada get an assistant who’s based in United State and Canada. Our stick rate right now is 85%, for the 15%, that unfortunately it doesn’t fit, we have a 90 day rematch guarantee so everybody can sleep easy at night. There you go my man. Jason: That is phenomenal. That’s a really cool story. I’ve gone through so many assistants. My business has been around since 2008. I would recommend everybody, your very first hire should be an assistant. I have always said that. The thing that I noticed in my own business is I try to do that too. I did the same thing. I had guys in India. In India, it was weird because it was like they speak a different English. It was English but it was like a different English. It was like I had to talk to a robot. It took me longer to explain things because we use so much slang. I never realized how much slang we use as Americans. Not everybody gets that slang. Philippines, probably a little bit better with understanding what we’re saying but I would say things and the communication was just so odd. It took so much time. I spent 2-3 times the amount of time explaining something to them. I’ve started realizing it’s faster if I just do it. Then I was just doing it half the time and it just didn’t work. The quality was just a huge issue because it was really hard to maintain that. I had people steal from me, I had people not be available when I needed them, not clock in, they were never there, they just wouldn’t get stuff done, some would do things but would do it wrong. It was this constant mess and disaster. Tim: I think if we’re going to do an apples to apples comparison, we need to think about what’s the dollar per hour cost in real terms. Maybe if someone from the Philippines is $4 an hour, and someone from United States or Canada is $16-$20 an hour, superficially, it seems like while the Philippines is way less expensive, what would happen if we put a very modest dollar per hour of $20, $30, $40, $50 an hour on our own time. That is an extremely modest number. I know when I consult, I consult for over $1000 an hour. My number I know very quickly can exceed even $50 an hour. I’m playing super conservative here not as a commentary on anything other than just to make this an apples to apples comparison. If I have to explain something three times at $20 per explanation, plus I need to fix the mistake later, that’s another $20, and how much have I really spent to get a 16-minute task done. I’ve spent somewhere between $16 and $100 to get a task done when in fact I could’ve just done it myself. Tim: Now all of a sudden an assistant from United States or Canada who is $16 an hour that I spend an hour explaining and now they’re doing that task and they’re doing it again and again and again without my intervention, goodness gracious! That is a steal of a deal. Absolutely steal of a deal. Jason: There is this fear. There is this fear that’s common. This pleasing side. My take on virtual assistants or assistants is that if you have somebody that’s in North America, that’s high caliber, they will produce at least, minimum, 2-3 times the amount of work and result. It not just evens out but it collapses your own time and speeds up. There’s so many things that we don’t think about culturally that are just different, even terms that we use, slang that we use in the US, that when you get outside of the US, there’s just this level of understanding that goes away. I found that I wanted to deliver the best service and the best product. I want to make sure everybody on my team, I felt safe with them holding my customers in their hands, that I felt safe with them communicating with them, that I felt safe with what they were writing, with what they were saying over the phone. That was a really big deal to me. I don’t think it will be fun to run an assistant company. I love that you’re doing this, I think it was great. Because it was so painful for me. I’ve had probably at least 10 personal assistants. I’ve had some outright steal from me, stealing time. I’ve had some that didn’t have the right skill sets, I’ve had some that just became unavailable, they just were like not there. I’ve kissed a lot of frogs. I had one really awesome assistant that I have for three years. But eventually, she was so great at what she did, she thought she was a writer when she came to me but I saw some genius that I was like, “I want you to be my assistant.” She was phenomenal. Eventually, she grew out of that role and moved on to bigger and better things and that was a sad day for me. Then I tried getting another one on my own, and that was the worst experience ever. Massive contrast. Then I started doing research. I was like, “I want to find the best resource for getting assistants.” I’m part of a really high level mastermind group as well. You’d be surprised how much of the conversation is about their new assistant and how their assistant’s bugging the all the time, interrupting them all the time, or their assistant is causing these problems. Getting an assistant it is an issue for people that have multi-million dollar companies, it’s a problem for me when we were really small. It’s a problem and challenge knowing how to deal with that. It doesn’t matter how big or small you are. Your first team member probably should be an assistant so that you can offload some of your stuff, and you can duplicate yourself and do more of what you want to accomplish. I did research. I started digging, looking around, I came across that podcast interview between you and somebody. It felt like you were sharing my story and experience with dealing with difficult assistants, trying things out, failing, and then how you’d figured it out and then I heard all these great studies and stuff when I dug a little bit deeper like your business. I was like I don’t want to take the time because I don’t have time anymore. Time’s my scarcest resource. It’s my most valuable resource. I want to give people money to get more time. That’s my dream. That’s what I want to do. Every single person on my team, they only exist so that I can have more time. Because I used to do everything. I used to do the copywriting, I used to do website design, I used to do all the phone calls, I used to do everything. Now, I don’t even look at my inbox anymore, at all, unless my assistant tells me to do it. You’ve been a big part of that. I came across Great Assistant, your company, and I was looking at you and your video made tons of sense. I was like, “Yes! I’ve experienced that. I’ve been through that. That makes so much sense.” I want somebody that can just take this off my plate. They can do all the work of posting the jobs, figuring out what I really need, matching me up, having me take a test and all of this, figuring out who would be a good fit, vetting these people, seeing if they are bright and intelligent people, seeing if they are people that would be able to connect and communicate well with me, and making sure that they understand how to take stuff off people’s plate so that they’re not just sitting around doing nothing, that they have the skill set and this ability to actually be a great assistant. I went through the process and I think for me, it took a little bit longer because I was probably one of your most difficult client ever, but within a month or two, I actually hired two assistants from your company. Because they were both great assistants, they both had different genius that they could help me with in the business. Now I got this fantastic assistant that she handles all my email, she does a lot of the repetitive stuff that I do on Facebook on a consistent basis. Every day I’d map out all the things that I have to do and then I just write a B next to it to give to her. There’s Britney, Britney, Brittney. I offload and give those things to her and I send her messages through my phone and everything. One of the things that I was really excited about, some people might think it’s expensive but I mentioned in a video earlier that I made last night that I would pay $10,000, $20,000 if I could undo the last assistants that I had. Because she probably cost maybe $30,000, $40,000 in business. I spent at least that much for the few months trying to figure out if she was good. She was hiding in padding hours and stuff. There’s this fear with a remote assistant. It was hard for me to figure out what was going on and eventually she hacked all my stuff, deleted our Google Drive, she got into my Facebook account, she blocked me from my own Facebook groups. It was an absolute nightmare. She was so upset. That’s when I reached out to Great Assistant. I was like I don’t want to play Russian Roulette anymore. I want somebody that has a proven process that can do this for me and just send me good people. I will interview them, and that’s it. That was it. I got a handful of interviews, two of them I loved and I endep up taking them both. I had a fantastic experience with the company. I didn’t want to tell anybody about you until I’d done that. It’s been a really great experience. Tim: We call the business Great Assistant, not Mediocre Assistant. I’m glad you’re having a great experience. Jason: Yup, phenomenal. One of things that I want to do for the listeners because I’m passionate about this is I set up a landing page for them. I set up a landing page you guys can get to if you go to doorgrow.com/greatassistant. If you go to doorgrow.com/greatassistant, there’s a landing page that explains a little bit about what you’d be getting but I have a little video there as well. And then if you fill up the form at the bottom, this will send you, Tim, a lead. This will send you guys a lead. But if they fill out this quiz, it will ask them these questions about whether or not they could use Great Assistant. This will help them understand it, ask some of the questions that you guys asked me. They will have a really good idea of whether or not they could use Great Assistant and it will send you a lead. Here’s the gift though, if you fill that out, there’s a gift that I created. I created a video last night that goes through and explained all the tools, and systems, and things that I use to leverage and feel safe that I built in my company to use an assistant efficiently and effectively and how I do that. It’s really quick and dirty. It’s 15 minutes long. I showcase probably 4-6 tools that I use in the business to really leverage and make sure that there’s really great communication between my assistant and that I’m off loading a ton of stuff. Tim: The idea of control and trust is definitely one of the biggest questions and objections people have. We actually surveyed 149 entrepreneurs in the fall of 2015. We ask them this one question, we said, “What is your number one biggest frustration and challenge in getting a great assistant?” I thought they would be like a few dozen different objections. Jayson, there were six. That’s it. 98.7% of respondents fell into one or many of these six buckets. And the number one is control and trust. I think that anytime in business, including in property management, if we feel like we’re taking an unmitigated risk, for taking blind risk, that feels horrible. I think it’s about do we reduce the risk, how do we manage the risk so that we can take something that feels like trying to jump over the Grand Canyon and how can we march the two edges close. It feels like we’re jumping over a pool and how can we march that even closer together. It feels like we’re stepping over the crack of a sidewalk. You can still [00:25:08] crack of the sidewalk and fall and skin your knees. It’s not risk free. However, there’s so much that can be done to go from Grand Canyon to sidewalk. For example if instead of hiring your sister in law, or the first person recommended to you through Facebook, if you expand your pool of talent to 50-100 people and that’s the police woman, now all of a sudden our risk had just gone down because we have more reference points. If you put in the Kolbe Test, and you know how to recall the test, you know how to interpret them, that takes a huge amount of risk and question out of the equation. If we then start doing work tests to actually watch this person in action before we hire them, that again reduces the amount of risk. If we now put them through some technology and some cognitive tests to test reading comprehension, reading, writing, arithmetic and reasoning, all of a sudden that further reduces the risk. It’s not any one of those steps that takes you from Grand Canyon to sidewalk track. It’s the combination of having a process and we’re fortunate now that with our economies of scale that we’re really able to really, really significantly reduce the risk. One of the biggest questions I get when I tell people, “You need an assistant.” They’re like, “What will they do? What do I have them do?” Let’s go through some ideas of how could they use. I’d love to get their brains worrying and imagining having a Great Assistant. There’s lot, a lot, a lot of repetitive work when it comes to property management. I only had four doors. It was actually my own house plus three doors. I had three doors and it was immediately evident to me. I couldn’t imagine anybody with dozens of doors if they don’t have an assistant. My head hurts for them. Something like any kind of preparatory docs and lease renewals, any tenant screening, obviously you might still have the final call on the tenant if you’d like, but there’s so much that can be done as far as pulling records, setting up any kind of interviews with past landlords. Posting rental ads can be super repetitive especially if it’s the same six pictures with the same 400 characters description going into all the different rental websites. Setting up appointments and dealing with potential renters that are here today but some ghost you, or flake, or whatnot. Even if your assistant is virtual and isn’t the one doing the viewing, they can still do the first 85% of the work to schedule in the person, make sure they know which address, make sure the time is right, contact them two days beforehand, make sure that they’re still on, contact them possibly the morning of. Then from there, when someone decides to move in, any kind of moving appointments; once you’ve gone from a viewing, we’ve done all the screening, we signed all the documents, any kind of contract signings, moving in appointments, scheduling those, making sure all the right paperwork is together. We’re in such a digital world now that if there are contracts like a docusign, lease agreement that’s online, making sure that that’s attached. As a property manager, could you imagine if you opened up your calendar in the morning, you saw you had a [10:00]AM moving in your calendar, you click on your calendar and everything is attached to that single appointment. Everything from the profile and questionnaire that on the intake, the agree to price, the docu signed contract which is already completed, the checklist that you’ll need to go through, if it’s in Google Docs or something else, a checklist to make sure that you see the renters ID, to make sure that there’s no rental fraud happening, to make sure do we still need to collect the money or has that already been e-transferred or wired depending on the lingo of your stare or your country. I always compare this to a surgeon. A surgeon doesn’t prepare the patient, the surgeon doesn’t prepare the operating room, the surgeon does not prepare the tools, the surgeon does not go down the hallway to get the extra blood to have on hand, the surgeon doesn’t do any of that, the surgeon rolls in and does what’s appropriate. At one point, maybe it was appropriate for the surgeon to be preparing tools when they’re in medical school. Maybe there’s another time when it was appropriate for them to grab the blood, maybe during the residency or something. But I’m telling you, once you’re the surgeon, you got to roll in and just do the surgery and then leave, and then go to the next operating room and just do the surgery and then leave. This isn’t an ego play, this isn’t the superiority, I’m better at this work or this is BS work. No, no, no. no, it’s about appropriateness. Every single part that happens in that operating room I vital. Every pint of blood, every clean sterile tool, every patient questionnaire, it is all vital. None of it is BS work. It’s just what’s appropriate. For you as the property management expert, you spent years upon years gaining your expertise, depending on your territory, region, state, province, you might even be a licensed in a certain right. There’s only things that only you can do. You’ve probably also risked the fair bits that putting your name on the line, saying, I’m going to take care of this property for somebody else or if it’s your own property for that matter. Let’s make sure that you are only doing the most appropriate work. You are the one making the final call, you are the one putting your signature on any important contracts of clients that if there’s any property to see, if they decide they’re going to take them on or not, you’re making those critical decisions. This is a writer downer, anything that is strategy, and anything that is high level skill and/or high level access. Maybe it’s not hard to log on to online banking and send a transfer or receive a transfer of money. It’s not a skill issue but it is an access issue. You’re the only one who maybe has access, that high level access to that bank account. Anything that is high level access, high level skill, that might involve negotiating or selling or being able to assess the situation and anything that’s strategy. We’re going to go do property management for multifamily or we’re going to go do just single family residential or we’re going to do uptown suited properties. Maybe part of the strategy is what websites are we going to advertise on, and/or what are we even going to put in our rental agreement, and meeting with the lawyer, and having those conversations. Anything strategy, high level skill, high level access, keep. That’s absolutely yours to keep. Pretty much everything else, overtime, you want to just get it off your plate. Everything from tenant inquiries, coordinating contractors, anything to do with scheduling. If you need to report back to your client who owns the buildings, and/or of they are investors and you need to pull data on a monthly basis just to check in on how it’s going, what of that is the high level skill? High level skill’s analyzing the data and possibly writing the report and submitting it. What is not a part of that is aggregating the data in the first place. What’s not a part of that is checking in with tenants. What’s not a part of that is that is checking vacancy rates. What’s not checking in with that is how much did each property cost us this month in maintenance and repairs. That is none of that. Aggregating of data and running around is high level skill. I think that that’s a crucial part is in our brain and it’s getting the goggles to see what about this task is high level skill, and access, and strategy, and what isn’t. Often times someone will say, “I can’t pass off my email inbox. There’s too much sensitive stuff that comes in.” Okay, hang tight there, is all of your email inbox the issue? Unpacking is one of the biggest secrets to getting to delegating a lot of this work. If we unpack your inbox into customers support, inquiries about vacancies, inquiries from your tenants about maintenance, any kind of coordinating of contractors, if we unpack that part of your inbox and had your assistant just tackle that, I bet you that would save you a boat load of time and energy. And then your assistant can just leave the strategy and high level skill stuff. The call with the lawyer, the call with the accountant, the call with the investor, the call with your client. That is now just yours. You can do that with anything. Any project, any task, any tool. If you unpack it into what does the surgeon do and in what is the surgeon not required for. If you split that line and you decide what falls on what line, you’ll find almost everything has a percentage and sometimes, a very hefty percentage that can be delegated. Does that make sense? Jason: Absolutely. The way I look at it is my work, and energy, and effort is either tactical work or it’s strategic work. I think that every entrepreneur should, if they could do a time study and take a look at where their time’s actually going, ideally your ratio should probably be about [50:50]. Or if you can lower it even more. But as business owners, we need to shift our focus away from tactical work, just doing it because we can, we need to shift towards strategic work and doing the things that actually move our business forward, help it grow, and focus on those high level task. The way I use my assistants, and I think one of the biggest things for property managers will be creating SLPs, creating procedures, looking at what’s being done currently in the business, maybe even asking you what’s being done, and you have a process you teach them for how to do this. You teach the assistants, that train on this so they can reach out and you’ve also created an environment in which have a Facebook group for cultural group of great assistants where they can get ideas and trainings and materials. I use them to document processes. This is a big deal for me. I’ll do a meeting with them, I’ll say, “Here’s how I do it. I’ll screen share, I’ll show them, and then I’ll say, did you get all that?” And we record it and they take notes and they document and turn it into a document that anybody on the team can follow. I use my assistant to triage and manage all my email. She just tells me, “Hey, you need to look at this one.” Or, “This one’s important.” Or, “I don’t know how to handle this one.” And then I answer it and she knows from then on out. We can build processes, follow up phone calls, “Hey, can you get me an appointment with so and so?” Lots of calendar, my scheduling, I gave her my ideal week, what I want it to look like, and she helps me block out and get the appointments in place. This morning, I sent her a Voxer. I was like, “Hey. Somebody was mentioning about something at Tony Robbins six whatevers. Can you find that?” She gave me a whole document with all of them defined. I was able to review it. Researching, finding, and betting tools, and vendors, property managers might be able to cast with some of that stuff, setting up events. Some event planning stuff, getting things scheduled, this crowd cast and this event in which we’re recording it, my assistant set this up for me, and set up the streaming and everything to all the different channels it’s going out to. She did all that because we had created a process to do that. I showed her once. If you could do it once, you can have somebody do it for you forever, which is great. Also, social media stuff, just tons of tasks that I look at when I make my to-do list every morning. If that’s $10 an hour or $20 an hour, that’s probably even $5 an hour. I’m not doing that type of work. I need to give that to someone else. Tim: One of my friends who has a few dozen doors up in Canada, her assistant helps her to plan investor events. When she’s looking to raise money, every month, they’ll play the cashflow 101 board game and so it’s her assistant that goes on to meetup.com, post the event, post the description, answers any questions people have and then also emails their database of past cash flow players, invite them to come back so that she’s got this nonstop machine of more potential investors coming through. It’s not like everybody who watched through is a potential $5000-$500,000 investor. It’s that there’s maybe going to be one person a month or every couple of months or something that would have $50,000 and then one person every quarter is going to have $500,000-$1 million to invest. It’s definitely a skew curve that way, like an 80-20 curve. How much of that money which she capture if she didn’t regularly have a presence to raise money? Tim: None it, right? On top of that, she’ll also do sometimes twice a year an investor only event. People who have invested with her, from the smallest investor to the biggest investor, she’ll invite everybody to her house, she’ll get servers to walk around, like the cashflow 101 game or monopoly, she’ll actually on the wall put a preview of the different properties that she’s currently working on flipping or acquiring or she has available for acquisitions. It’ll be a picture and it’ll have all the expenses and then a positive or a negative cash flow number just like the cashflow 101 board game. It feels like she’s almost gamifying it. People are coming, they’re looking around going, “Oh holy smokes. She’s got a few dozen investors. Wow. Okay, she must be pretty successful. She’s got servers walking around with food, that’s a nice touch. Free wine or whatever. She’s got all these properties on the wall that she’s working on at any given time. These are the properties that she owns. It’s her assistant that is helping with the invites, and the guest lists, and sourcing the food, and making sure that all of those posters are on the wall looking good even if her assistant is local, you can still do almost all of that remotely. What does that allow my friend to do? It means now she can focus on sending a friendly text message. Just one text message, as a friendly reminder to anybody who hasn’t confirmed a couple of weeks in advance. When she’s actually at the event which she hosts at her home, she actually can spend time connecting with people instead of running around trying to figure out how to get the right thing printed at the right print shop. Just allows her high level access, high level skill, having the investor conversations, having access to the investors and what’s the strategy? She’s able to map out we want to invite all of our investors and let’s invite them all to bring a friend. Oh interesting, birds of the same feather flock together. If you’ve got someone who’s invested $100,000, they probably know somebody else who can also invest $100,000. I’m giving an example that’s lateral to just pure property management. I do know that a lot of managers though also have their own properties. How much more money could you raise, how much more prospecting could you do to raise money for your own deals if you just had time to go and do it instead of running around doing maintenance requests and dealing with all the documentation for someone before a move in, and posting all your ads to the rental websites and on and on and on. Jason: I think there’s a competitive advantage. I’ve run a virtual team for the entire life of my business. I want to touch on this idea because there might also be this fear of having a virtual team member instead of having somebody right there in their office. I want to point out what I believe is the competitive advantage or the benefit of why that’s even better than having somebody in the office. One of the biggest complaints I hear from high functioning CEOs or entrepreneurs that have assistants that are in their office, especially when onboarding is how the assistant feels like their job is to keep asking you what do you need? What can I help you with? What do you need to do? There’s this constant barrage of interruptions. One interruption for me can cause thousands of dollars. For my team members though, my staffing cost were cut in half after I went through and was trained by Jason Fried of Basecamp fan and how he leverages virtual teams. It cut my staffing cost in half and it was all based around this idea that I was being interrupted constantly. We cut down the interruptions, my staffing cost were cut in half immediately. I built a culture that is around the idea of no one interrupting anybody and only reaching out to the people that are relevant. By having a virtual assistant instead of somebody here in my office, I’m not interrupted constantly, I’ve created systems in which she can reach out and communicate with me and ask questions that do not interrupt me and I can get to them when I want to. And then I’m not bugging her all the time. The other real competitive advantage is everybody’s had it where they brought in a team member and then everybody starts using him. I don’t want anyone else using my assistant. If they’re at arm’s length and they’re reachable, everybody starts to steal them. I bend that person in the company where the boss wanted to meet to work with me directly and then other bosses started cropping up all over the place. I became the Indian with too many chiefs and was feeling really frantic and got out of that business because it was very uncomfortable. It protects them as well from their time being taken or being used or leveraged by other people around you and the company. I think there’s a big advantage of creating that distance in that space and the vast majority of anything they could do, they can get done. I think there’s a big benefit for me in having somebody that’s virtual instead of them being nearby. Tim: There’s another huge competitive advantage and I only saw this once I had hired many dozed assistants. I had a suspicion about this and it’s since been irrefutably confirmed for me. Let’s imagine that you are in a small car accident or a car wreck and there’s different word for it. Just a fender bender. Let’s say you want to get that thing fixed. You’re suddenly encountered with a triad of factors and you’ve got a decision to make. If you want to fix your bumper and you want it to be good and fast, it’s not going to be cheap. If you want it to be fast, and you want it to be cheap, it’s not going to be very good. If you want it to be cheap and you want it to be good, you have to call your uncle, and he’s not going to come very fast because he’s going to work on it evenings and weekends, whenever he gets around it. Jason: You can’t have it all. Tim: Good-fast-cheap. You always got to pick two of the three. We can never have three of the three. That’s very, very rarely we ever get three out of three. I noticed the exact same is true with hiring. The names are different though, it’s not good fast cheap. It’s talent, compensation, and working conditions. If I say to somebody, I want you to be really talented, and I want you to work 9-5 in my office on my working conditions, I’m going to have to pay a ton for that person. That’s what’s called a traditional 9-5 day job. That’s going to cost me $60,000-$70,000 a year. Jason: I feel where you’re going with this and it’s genius. Keep going. Tim: Thank you. If I am however willing to be flexible on the working conditions part, now I get someone at my pay rate who is exceptionally talented. That is a big reason why we only hire virtual assistants for people who are willing to work with a virtual assistant. Because the calibre of talent we get so blows away what we’d be able to get otherwise. $15-$20 an hour, you might get a college kid, let’s be honest. If they had to sit next to you, or maybe you get somebody who is newer to the role or whatever. If you could see the collection of resumes that we get, from people who so badly want to work from home, you would be shocked, you would be shocked at the number of college degrees. Sometimes we’ve even had people with their masters apply, because you know what’s more important to these particular applicants than getting maximum salary, is having the ability to see their kids off to work in the morning. Most, not all, but most of our assistants are women, more of them are in dual income households, most of them come from corporate America, government America or professional America. My assistant was a paralegal, Sarah was a paralegal before she came to work for me. They have this fit, and this finish, and they have this business language, and they can read, and write, think, and be at a higher elevation of compete in participation. I actually hired an MBA student in HR to do this research for me. I said, “No agenda here. Tell me the truth. Tell the truth of what you find. I don’t want you to specifically dig up one conclusion or another. Specifically just go objectively and do this research. What percentage of people want to work from home in the United States of America?” She went out and she answered that and a few questions for us. I’m sure you’re not shocked to hear that it was around 67%-68% of all Americans wish that they could work from home full time. It was approximately 96%, 97%, 98% of all Americans wish they could work from home part time. There’s people that value the in work experience and whatnot or the in-office experience. That’s great. You tell me, whether we take the 67% or we take the 97% number. Do we have 67% and 97% of workplaces in America offering work from home? Absolutely not. Absolutely not. There’s some, it’s becoming more of a thing, but we are such a beautiful intersection technologically that we now have video and we’ve got online project management and all this in-team communication tools. The technology access intersecting with the social access that demand for work from home plus just the workplace reality of corporate America not being flexible, this is the time, there has never been a time in the history of employment before now that allowed this intersection of technology, social factors, and workplace factors. We get to be at the cutting edge of that to take advantage of it and get someone who used to make $85,000-$100,000 a year work for us for $16 an hour, are you kidding me? All I have to do is be okay with them working from home flexible hours. Tim: Sarah doesn’t sit by the phone 9-5. We’re clear at what her objectives are, and as long as she answers and triages the inbox once or twice a day, it doesn’t matter to me if she does it at [9:00]AM or [11:00]AM. It doesn’t matter if it’s [1:00]PM or [4:00]PM, just do it twice. If you want to go volunteer at your sons violin lesson concert, go for it. If you want to go build gingerbread houses at the kindergarten class, go do it. There’s something about the pricelessness of those Kodak moments of being with your kids. Unfortunately, not everybody can take advantage of that because they don’t have a second income in the home or whatever. The people that are applying for our roles do. It just creates such spectacular opportunity for the assistants to capitalize those precious once in a lifetime moments and for us as entrepreneurs to help them and help ourselves in the process where the most touching text messages I’ve ever received is from Sarah. It’s about six months after she started working for me. She said, “You know what Tim, this is why I work for you.” She sent me text messages of her kids playing in the backyard and she had the time to be with them. Jason: They don’t get it. Tim: They do not understand, and hopefully, through today’s sessions, we’re able to show the reality. Jason: Let’s take this back to where you’re saying. You’re saying you can’t have those three things normally. You said the three things though when it comes to staffing or hiring, you said talent, compensation, and working conditions. What’s unique about today’s day and age, to draw this all back, it’d be great in all three for a Great Assistant. My assistants have incredible talent and skill, the compensation for them is great because they have so many reduced cost. They don’t have gas time, they don’t have mileage, they’re not commuting, they don’t have to get child care. There’s so many things that they would have to spend time doing and being and whatever. They get to be in the most comfortable environment they know, which is home. The working conditions is great and overall compensation is really good for all that. Really, they’re getting all three. They love it. Everybody on my team is in a situation like that because we’re a virtual company, none of them want to be in a situation in which they have to go sit in office 9-5 and be at the beckon call or just waiting in the business for something to do. It’s just not what they want. It’s a dream job for these Great Assistants. Tim: I think it’s fairly safe to say, if I might speak on behalf of 98 people here. Is that for them, the working conditions are part of the compensation. In any situation, there’s the hard compensation and the soft compensation. The hard is the dollars, and the soft is the experience of being with your kids in the morning or something. Jason: I love the time with downsides and then any other really calming questions that you get asked. And then we can wrap this up. Tim: After I read the 4-Hour Work Week and I got my first ever assistant in India, ended off, went down in a ball of flames, approximately $10,000 worth of flames in fact. I realised a few things. The old adage that when we’ve got one finger pointing at somebody else who’ve got three or four fingers pointing back in themselves. When I ask myself what’s my role in this relationship not working out, it wasn’t that my first assistant was a bad person. She wasn’t, she was a spectacular human being. She had amazing British English, she sound fantastic, there are no issues there. Here is the issue, is that I got an assistant too early. That was the first of two issues. Jason: You weren’t ready for it, and not everybody’s ready. Absolutely true. Tim: Right. An assistant is going to need some leadership from you on what task should they go tackle first. If I don’t have a big enough business or if I don’t know how to do my business well enough yet, or if I don’t see what the repeating tasks are, it’s probably too early for me to get an assistant. Once you’ve got a couple doors though, and you’ve had at least six months, you start seeing, oh right. I need to think about lease renewals every year or every six months. Oh, that’s right! The process that we follow to screen our people, our tenants is the same. Oh, okay, okay, now we’re starting to get it. I wasn’t even in that point. I hadn’t reached that point where I could see how I made money and what the repetitive tasks were. Likewise, for everybody listening, if you are not at the point yet that you can see both what the lower value activities are, and with the higher level activities are, then it is just going to feel like an expense. Once you start going oh, holy smokes! You mean, I can get rid of all these scheduling stuff and that would give me an extra 3-4 hours a week, and that would allow me to call on a few more potential investors and that’s going to help me close another deal which then should put an extra $5000-$10,000 on my pocket in the next year. It’s a no brainer. If you can’t see it though, if you can’t see what the lower tasks are and what the higher tasks are, then it might be a little bit too early. What I would just be careful to say is being able to see the tasks, sometimes we can say jeez, I’d sure love to get rid of my email inbox, we need to circle back a little bit to what we said earlier. Sometimes you have to split the task into parts. If someone says, “Ugh, dealing with all of our trades people is such a drag, it’s so repetitive, it’s the same traits people, it’s the same issues, it’s the same five issues you just come up again and again. But I just don’t know if I would be able to hand that off because I got to pay them, and I don’t know if I trust them.” That’s fine. Just split that in two, just take the coordination piece, and the paperwork, and all the rest of that, let’s give that to the assistant and you as the entrepreneur, owner, and/or manager, you can hold on to actually paying the trades people, you can be the one who selects the tradespeople, you’re the one who can tell the traits people the first few times where to the best faucets to use, the best toilets to use, or whatever. Just split it in two and away we go. I think that that’s really key. Challenge some assumptions. Split tasks and parts and from there, if you can see, even just in the beginning, just a few hours a week, 5, 10 hours a week, what are the higher level task or the lower level tasks. Now it’s time to go get an assistant. Jason: Yeah. I love that. If you’re the entrepreneur that is struggling in your business to the degree in which you view your came as some sort of servitude or slave to you, or you viewed them negatively, in general with your team, you’re also not a good fit to be part of this type of program. There are entrepreneurs that they think, because they are paying somebody money, that they can treat them terribly. I don’t resonate with those type of entrepreneurs, I don’t like working with those type of entrepreneurs and they reveal their colors pretty quickly when they talk with me. If you’re asking a question as an entrepreneur, why can’t my team just do this? You are the problem. You’re the sun at the center of this universe, and a lot of times we want to externalize that and we want to blame our marketing, we want to blame the business, we want to blame our team. If you’re blaming everybody, you are not ready for an assistant. It’s not going to be a good relationship. Instead, you should be saying, once you evolve as an entrepreneur, you’re usually saying how can I support my team more? How can I give them the tools they need? How can I make sure that they have everything required? You shift into a role of instead of why can’t my tam get me ahead or how can my team get me ahead to how can I support my team. I see my roles in entrepreneur is my job, is now to support my team. That’s what I do. How can I help all of you do a better job at whatever you’re doing? I meet with them and I ask them question that give me great ideas. I’m now supporting them or they’re like, I need more help with this. Okay great, let’s figure out how we can create that. I need somebody else to do this. Oh, we’ve got this person on our team that is great at that, let’s pull them in. If you are the type of person that is like I love the people that I work with, I love my team, and I could use some additional support, and I’m willing to support that person, then this would be a great relationship that you could create in having a great assistant. Tim: I think one of the number one activities that entrepreneurs, it’s like a light bulb that goes off. For some it goes off and other it doesn’t unfortunately. If we were to put all the activities that any entrepreneur does, you and I included Jason, we would see that there’s a dollar value and it does fall on 80-20 curve, where the bottom 80% is worth far less than the top 20, that’s really fantastic. Often times, as entrepreneurs, particularly if you haven’t had a successful assistant in the past, an entrepreneur will say, “Thank you Jason and Tim. I can now see the possibility. But I’m so frustrated, I’m stuck on the bottom 80%. I can’t go do more the top 20. What is the deal here?” I’m telling you, it’s two parts. It’s one, it’s getting the right person to support you, and secondly, it’s wholeheartedly embracing the role of being a coach. A lot of entrepreneurs think coaching zone how to do a task is a waste of time because you’re not actually doing the work. You need to redefine what the work is. Is the work posting the ad? Or is the work developing the person who’s going to go post that ad 800 times for you, and you’re going to return on investment on it forever. Instead of being mad that you have to go plant the seeds, because it’s not giving you flowers right away, it’s not giving you food right away, be ecstatic to be pouring seeds into the ground, and sunshine, and light, and water, because it’s that coaching effort that you put into a person. Remember, hiring someone, we’re very thoughtful about it, we’re expecting them to be with us for at least three years, and we’re also thoughtful, this is another great tip, what is the order of what we’re delegating. Entrepreneurs, particularly if they’re a high quick start on the Kolbe test, they’ll get an assistant, they’ll say, oh my goodness! I have more bandwidth. That means that now I can go start a podcast, I can start a newsletter, I can host more events, I can go do more, go do more, go do more. Hold your horses, that’s exactly the wrong place to start. We want an assistant, first of all, to be taking over stuff that you already are doing. Jason: Absolutely. I was thinking, as a very strong quick start, but yes. Totally, agree. Tim: You’ve touched the stone few times you’ve burnt your hand. Now you realized that we’re going to start with what you already are doing because by virtue of that, that means you can really quickly train somebody else how to do it and furthermore, you can also evaluate their performance to coach them along the way and it doesn’t take long. It does not take long for them to get to your level. Parallel to that is picking the right tasks in the right order. We’re going to pick something we already do and specifically something that happens regularly in the business. If it’s getting all your documents together to submit to your bookkeeper, and that happens once a year and it’s not happening for another 10 months, it’s not the right place to start. It just isn’t. It’s going to feel like a waste of time, that you spent all this time training somebody but you’re not actually getting any time back for another 10 months. I want you to get your time back in a day from now or in a week from now. I want you to record yourself using Loom, which is the same tool that Jason used in the bonus training when you opt in for the survey at the bottom of the screen here. I want you to pick a task that is relatively easy to learn for your assistant, relatively easy for you to teach, maybe half an hour for creating the training and for them to learn. Maybe something that also is not like a vital business breaking activity if it goes wrong. Let’s keep it simple, nothing critical that it’s going to break the business. I can’t say it enough, it’s got to be something that happens at least once a week in your business. Ideally more than once a week in your business. That way, if it’s a Monday morning, you identify the right task, you take an hour to record the training and you teach your team member, then on Wednesday, they can watch you do it and on Friday you could watch them do it to make sure the training cycle is complete. The following Monday, they’re now doing their task for you and you’re getting pay off seven days later. There’s something that we’ve identified, I call it the trough of sorrow. Everybody, when they get an assistant, the fantasy is oh she’s getting an assistant, I’m going to level up and everything’s going to be sunshine and rainbows. The reality is just the opposite. You’re actually worse off when you get an assistant. Because you do have to take time to onboard them and train them, and you do have to manage them on and on and on, going basis and whatnot. Here’s the thing, as time goes on, the amount that they are a negative investment starts to become less and less, and now they’re getting closer and closer to break even, then they hit breakeven usually within 2-4 weeks, but it doesn’t stop there because as you continue investing in them, now there are positive ROI where you put an hour in and you get four hours of your time back. They just keep climbing and climbing and climbing until guess what, they need that original lottery expectation that you had. That’s usually within the 1-3 months, sometimes 4, 5, 6 months, somewhere in there. But guess what, it keeps getting even better. Because they keep getting better as you continue investing in them, and now they’ve exceeded your wildest expectations that you had back in the lottery mindset. I call that the investor mindset, first is the lottery mindset. If you think you’re going to flip a switch, and you’re going to be a millionaire in a day, that’s never going to happen. If you think you can become a millionaire overtime, because you’ve diligently put the right activities in the right order in the right direction, absolutely. It’s America. This is a country where that is possible, same thing in Canada. I just think like picking the right activities in the right order and having the right expectations in the beginning, particularly around wearing that coach hat. When someone says, oh, I don’t want to have to train them. I think you’re crazy. Jason: Or they leave just because they didn’t get those support they needed and the training. Yeah, absolutely. Everybody should view every team member they bring on as an investment. A good team member is like a fine bottle of wine, the longer you have them, the better they get, the more critical they become to your operation, and the bigger their ROI and the return that you get from them. My longest running team members that have been with me the longest have gone through all kinds of ups and downs with me, they’ve seen how we do things, they resonate with me, we’ve created a culture. The longer you’re able to maintain somebody. Don’t choose into getting a great assistant if you’re looking for something quick and dirty to upload some tags to. Look for a relationship that’s going to make a massive difference in your life. I think also, for me, when looking at what to offload, the most significant things to offload, the quickest. Instead of me looking at time, I look at energy. These are both different currencies. There’s also cash and there’s other currencies but for me, if I focus too much on time management. I’m like, what’s taking my time? And I just focus on that, I may still end up living my life doing things that are not in my area of genius, that I don’t love doing. I’m busy and I’m working hard but I hate my life. I acted like the biggest wins when you onboard a new assistant are to figure out not just what’s taking you time but what’s taking you time that you hate doing. What are the most difficult things for you because entrepreneurs are generally like profile people. A lot of times are a bit more driven, and the things that you think they will hate, they love. I find that my assistants love doing the things that I hate doing. It’s this amazing symbiotic relationship, and I want to give them the things they love doing because I know I will never have to motivate them to do it. That’s hard wired in. Tim: Believe it or not, there really are people that love to just organize things in right procedures. I’m with you. Energy management versus time management. Because here’s the gift of energy. When you focus on the things that energize you, or that give you life, or that you love doing as opposed to the things that you do the opposite, you have more of it. You can work longer days, you can work with more intense mental capacity, you feel alive and on fire. I recommend all of you get an assistant so that you can do more of what you love doing so that you don’t have burn out that is inevitable if you are doing the things that you don’t enjoy doing. Tim: I think the word that I use is, I want to be careful that we’re not delegating things that are difficult because they’re high skill. I would want to delegate things that are difficult because I procrastinate because I hate doing them, because it’s not how I’m wired. Tim: If you look at your to-do list and you say, whatever I’m procrastinating on from the last two, three four weeks, just circle those items. Then from there, ask yourself, which of these could I teach somebody else how to do in under 30 minutes or something and it happens regularly, that’s a winner right there. Now we get to get our time back and our energy, and indirectly, although very powerfully by having more time now we can in fact go chase the next currency money, or whatever the case may be. Jason: Cool. Tim, it’s been a pleasure to connect here with you and get to know you a little bit more, and have you on the show. I appreciate you sharing your story, really inspiring to hear you move through that process and I really appreciate what you’ve created, and I really appreciate and grateful that I was able to find you guys and what you have done to help me in my own business. Tim: Yes. Thank you for having me. We’ve got a PDF also, if people aren’t quite ready to go through the question or whatever, can I share that or you should maybe link that up somewhere else? Jason: Absolutely. You’re welcome to share here and for those listening later, we can plug it in on the page or I’ll put it into the funnel, but you can email that to me and we’ll get it in place. But everybody go to doorgrow.com/graetassistant, check out the details there, watch my little video and fill out the form and this will send an email out to your team Tim, and then on the next screen there, I have a training, and you guys can check that out. We may alter that funnel in the future but I have a value add there for you guys so that you can hear some of my secrets and how I off load things to my team and the tools and systems I use. This will be a big shortcut for you guys. Hopefully that helps you guys out. Tim: I’m happy to sweeten up page, let’s get the PDF up there. The PDF, it’s a full list of over 100 tasks. It’s not comprehensive, but it’s a snippet of task not an assistant can take over. We’ll put it on that same page you’re talking about so people can get your property management specific ideas plus the PDF we’ve produced all in one spot if they go ahead and go through the questionnaire. Jason: Perfect. Alright. Thanks again Tim. Sure appreciate you. Jason: Alright. For those of you that listening, make sure to check out that page. I really appreciate Tim being on. If you are not a member of our DoorGrow Club, go to doorgrowclub.com. This is the ultimate Facebook group for property managers, property management entrepreneurs. We’re only letting in property management business owners. It’s a safe place for you to get ideas, people are sharing tools, vendors, technology, it really is become the go to form for property management for business owners. Check that out, go to doorgrowclub.com and check out our awesome Facebook group. I’m Jason Hull with the DoorGrow Show and we are done. Bye everybody. Listen, everyone is doing the same stuff; SEO, PPC, Pay Per Lead, content, social direct mail, and they still struggle to grow. At DoorGrow, we solve the biggest challenge getting deals in growing your business. Find out more at doorgrow.com. Find any show notes or links from today’s episode on our blog at doorgrow.com. To get notified of future events, or news, subscribe to our newsletter at doorgrow.com/subscribe. Until next time. Take what you’ve learned and start doorgrow hacking your business and your life.